You may have an interest in ‘Kimono’ which is a Japanese traditional wear. You can rent or even buy one secondhand in shops. 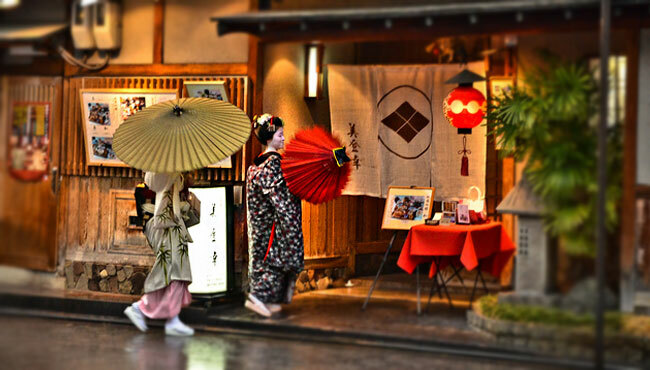 We recommend you walk around Asakusa, that is an old town in Tokyo, with wearing a kimono. It would be nicer to go riding on Rickshaw. Feel the wind in Shitamachi-Asakusa on Rickshaw wearing a charming and fascinating kimono that you choose in tons of kimonos. Japanese people wore kimonos until the Meiji period but today they don’t wear them as often in daily life. Most of them wear kimonos for only special occasions such as wedding receptions. So, you will not see many Japanese people wearing Kimono when you are traveling in Japan…disappointing? Then, how about you yourself wear a kimono!! There are many kinds of kimonos. For instance, Yukata is a type of casual kimonos made from cotton. It used to be worn at home as a sleepwear so Yukata is much easier to wear, but nowadays people wear Yukata in summer especially when going festivals. It is hard to put on a kimono by oneself but no need to worry. Most rental shops have dressing services, also all other items such as socks, bags, shoes, hair accessories and Japanese umbrellas could be included so that you can rent a kimono without any preparation in advance. Recently, many kimono fabrics particularly for rent are made from polyester for mass-product and less troubles to look after, which are mostly washable with a laundry machine. However, you can still find kimonos made from pure silk in some shops. When you dress a kimono of pure silk, you can feel a pleasant soft & smooth texture, and also you look more graceful in this particular types of kimono. In most of traditional towns in Japan, you can see Rickshaw, such as Kyoto, Kamakura and also Asakusa located in Northwest part of Tokyo. Mostly Rickshaw in Asakusa is standing or moving around Senso-ji that is the most popular temple in Asakusa. Rickshaw runs 8-10km/h that is twice faster than walking speed of an adult. Riding on a rickshaw is comfortable with your eye level slightly higher than when you walk, and it will give you different views from usual. The driver wearing the traditional uniform will explain about the sceneries & sights around you with an interesting conversation. You can make a reservation or have an on-site arrangement at the rickshaw stands. When getting ready, you can go to walk around Asakusa town with the kimono that you chose. When you are wearing a kimono, you will find that your movement is limited by the clothing around your body, which is tight and that makes your posture and movement graceful. It would be difficult for you to walk a long distance with the first time wearing a kimono, so Rickshaw can be a big help for you to look over the town! Both Wargo and BIREI that are introduced shops in this article help you to book Rickshaw. When dressing Kimono is done, a rickshaw will come to pick you up at the store.